Nasima Hussain is a Consultant Family and Systemic Psychotherapist and Course director for Systemic Psychotherapy courses in the NHS. She has an MA (year1) in Psychoanalytic Studies/Infant observation and an MSc in Family and Couple Therapy and is a qualified Systemic Psychotherapy supervisor. 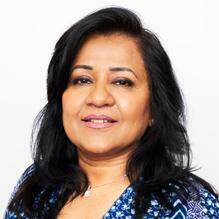 Nasima has over 20 years’ experience in the NHS and working in private practice. Nasima has extensive experience of direct clinical work with adults, adolescents, children and families which include assessment and treatment of problems such as, anxiety, depression and anger management in adults. Anxiety, depression, ADHD, self-esteem and behavioural/school problems in children and adolescents. She uses a range of therapeutic models primarily systemic psychotherapy and also includes Psychodynamic and CBT. To compliment her clinical work, Nasima has extensive experience in working with diversity, and specialises in cross-cultural work with South Asian families, and is a bilingual therapist and fluent in several South Asian Languages. Nasima is described by her colleagues as a compassionate systemic therapist, with vast clinical experience across a range of mental health presentations, age groups and cultural backgrounds, who engages both her patients and their families throughout. Clinical Partners is pleased to present Nasima as part of our London Clinic. You don't need a GP referral to see Nasima Hussain.